It depends on which colleges you apply to. If you apply to colleges that use the FAFSA only for calculating financial aid, equity in your primary home is not considered. 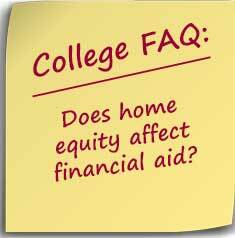 However, if you apply to schools that use the CSS/Financial Aid PROFILE, home equity is likely to be considered. This is based on standards initially released by the 568 President’s Group where a group of schools agreed to a consensus methodology for calculating family financial assets. However, the formula has been adjusted since then and very few schools include the actual formula with their financial aid information. Currently, Stanford provides information on how it uses home equity stating that “we cap the amount of home equity considered at 1.2 times the total family income.” Yet, it’s difficult to find any other schools as forthcoming. You can get some idea of which schools count home equity by using net price calculators (NPC). If your home has appreciated a lot, ask private colleges how they factor in home equity when determining aid, advises Paula Bishop, a financial aid consultant in Bellevue, Wash. Their answers may differ dramatically. Some schools, such as Princeton University, ignore home equity. Others, such as Boston College and American University, include 100 percent of it as an asset. You can find a list of schools that are using the CSS/Financial Aid PROFILE here.